We are running a Science Blogging day to start working towards the European City of Science. Over one day, we want to kick start the Manchester 2016 Science Bloggers community and give you a platform for the year. We’ve got a great line up of contributors and our aim is to populate the ECOS website with stories. This invitation is open to all academics and postgrads across the University of Manchester, University of Salford, and Manchester Metropolitan University. 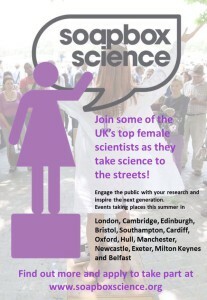 Soapbox Science – call for speakers now open! Soapbox Science, a national Women in Science event is coming to Manchester for the first time in 2016 as part of European City of Science. We want to place 12 inspirational speakers on soapboxes on Saturday 23 July, and encourage them to engage in and start conversations with the public about their work. We are looking for women in all areas science, from PhD students to Professors, and from entry-level researchers to entrepreneurs, who are passionate about their work and want to spread the word. 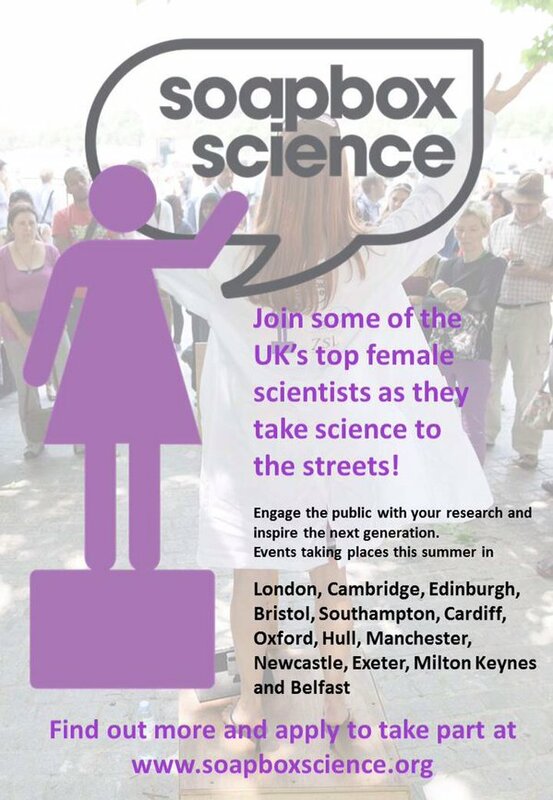 The call for speakers is now open (www.soapboxscience.org), so if you want to take your research to the streets, get cracking! The University has an excellent record of collaborations and partnerships between the sciences and the arts. This has included teaching between arts, humanities and science students, research projects between colleagues or with outside organisations and large-scale public engagement events. In academic year 2014-15 the University is seeking to support new initiatives that develop innovation within this field. We believe there is teaching, research and engagement/impact benefits to these collaborations – and believe arts/science projects can contribute in creative ways to our social responsibility agenda. Arts/science projects and events planned as part of this scheme for 2014/2015 will be preparing the way for public engagement events planned as part of the European City of Science 2016. Full details and an application form can be found here and applications are encouraged from all areas of the University. The deadline in 30 September 2014.